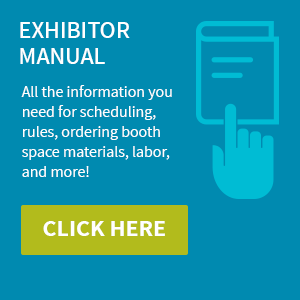 Here you will find important details, deadlines, specifications and opportunities in regards to your exhibit at The Vision Show. Unfortunately, several exhibitors and attendees fall prey each year to accommodation, advertising, shipping, and other offers from fraudulent companies. These providers present themselves as our official partners when they are not. These groups are in no way affiliated with The Vision Show and their claims are false. All vendors we are officially partnered with are listed here. All exhibiting companies must provide a certificate of insurance prior to move-in. This insurance is strictly liability insurance for any injury that may occur in or around your booth and does not cover damage or loss of personal property. Liability insurance of no less than $1,000,000 naming The Vision Show/AIA and Hynes Convention Center as additional insured must be obtained by the exhibitor at their own expense. See below for full addresses of the additional insured. Neither the Association nor their agents are responsible for any property loss or injury that may occur to the person or property of exhibitors or their guests, invitees, employees, or agents from any cause whatsoever, including cancellations or impediments to the conduct of the event. The exhibitor, on signing the contract, expressly holds harmless and releases the aforementioned from any and all claims for such loss, damage, or injury. The exhibitor agrees to pay for any damage (incurred through carelessness or other cause by the exhibitor, his employees or agents) to the facility, its equipment, or to that of another exhibitor. The exhibitor assumes entire responsibility and agrees to protect, indemnify, defend, save, and hold harmless The Vision Show and its agents, officers and employees against all claims, losses and damages, including attorney's fees arising out of or caused by: Exhibitor’s installation, removal, maintenance, occupancy or use of exhibition premises or a part thereof; the use of any patents, trademarks, copyrights or other rights owned or processed by a third party. Contact your company's insurance provider to obtain a certificate of liability insurance. In the unlikely event your company does not have liability insurance, which covers your presence in trade shows; you can obtain it through many insurance carriers. A carrier option is listed below but many more options are available via a quick Google search. We're providing exhibitors with complimentary, customizable website widgets and email graphics to help drive traffic to your booth. 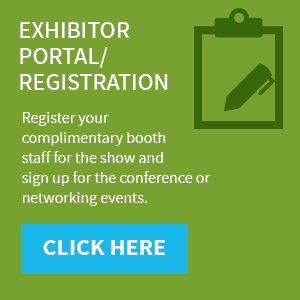 Download The Vision Show logo and place it on your website and in all of your communications to customers and drive more clients/prospects to your booth. Link to https://www.visionshow.org. To attend The Vision Show as a member of the press, we encourage you to pre-register. Onsite registration will require that you bring your press credentials (official press badge from your organization, or business card from that organization) to The Vision Show registration desk. You must be a member of the working press to obtain a press badge and to enter The Vision Show’s Press Room. A press badge provides entrance to the show and press conferences and entrance to any conference session, simply show your badge to the conference room monitor. For more information on attending The Vision Show as a member of the press, please contact Bob Doyle. There are several marketing opportunities available at The Vision Show. For questions, please contact Jim Hamilton. Please reserve your room by March 16, 2018 to receive discounted room block rates.